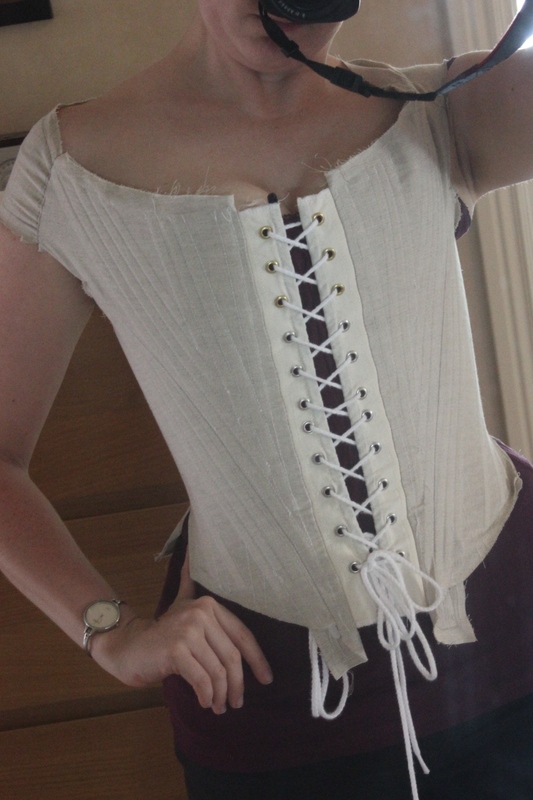 The first thing to do (once I had a working pattern) was to make the foundation for the bodice. 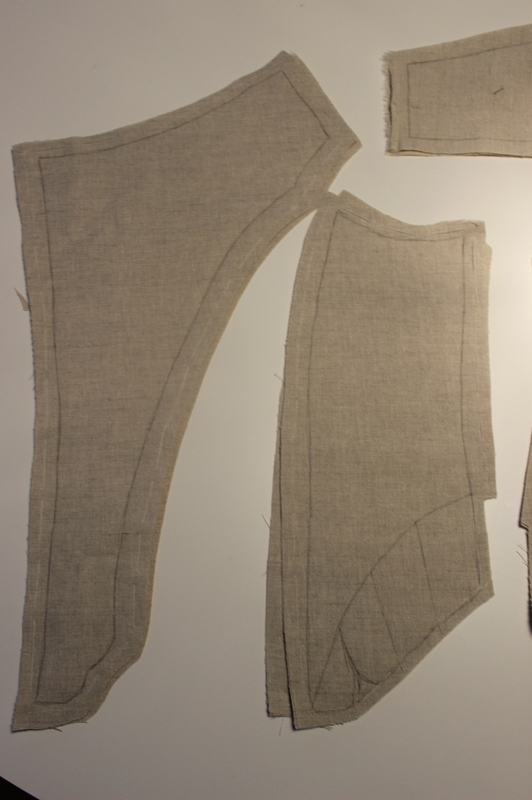 So I cut two of every piece in a sturdy unbleached linen, and basted them togeter. 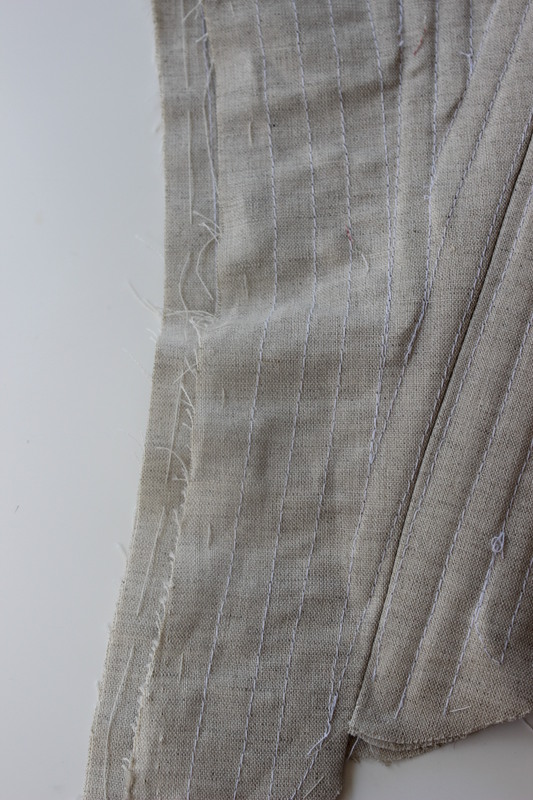 Then I penned the boning channels (using some of my books as guides). 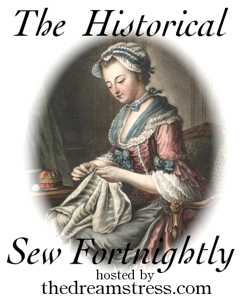 I stitched all the channels and then attached the pieces to each-other. 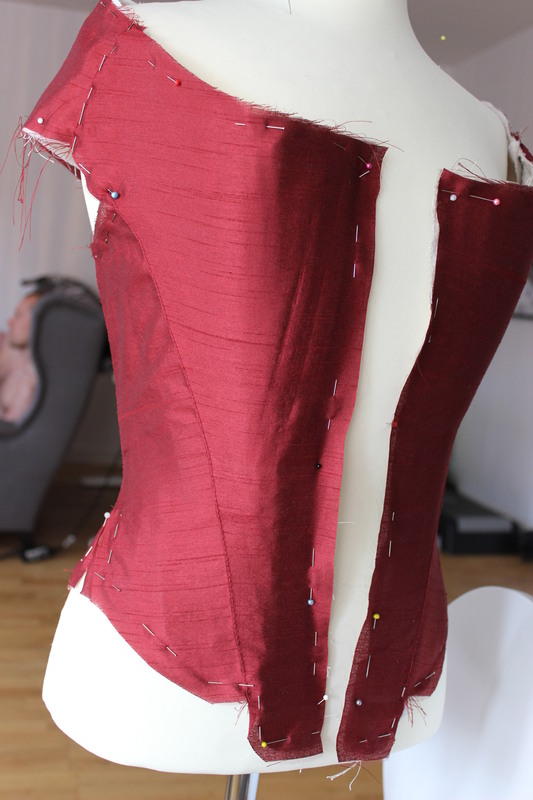 Then it was time to ad the boning. I used synthetic whalebone, and cut each piece to match the channels. 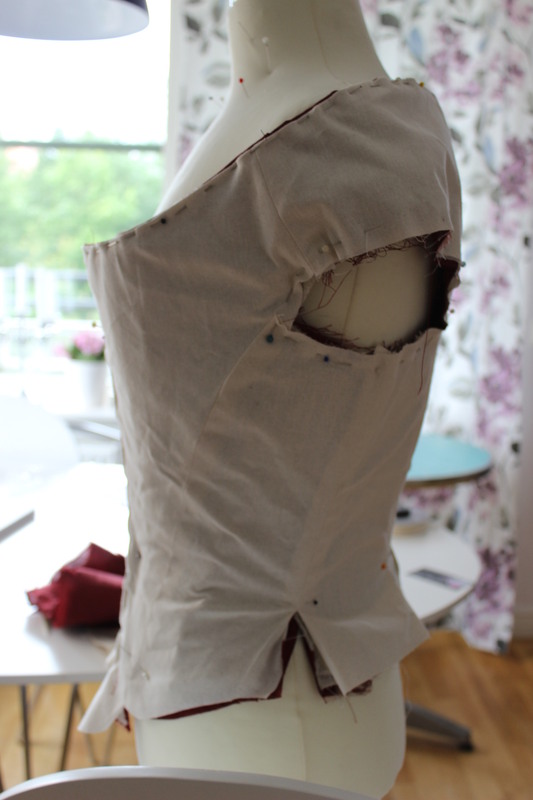 The one thing that worried me most was the “shrinkage” almost always caused by adding boning. 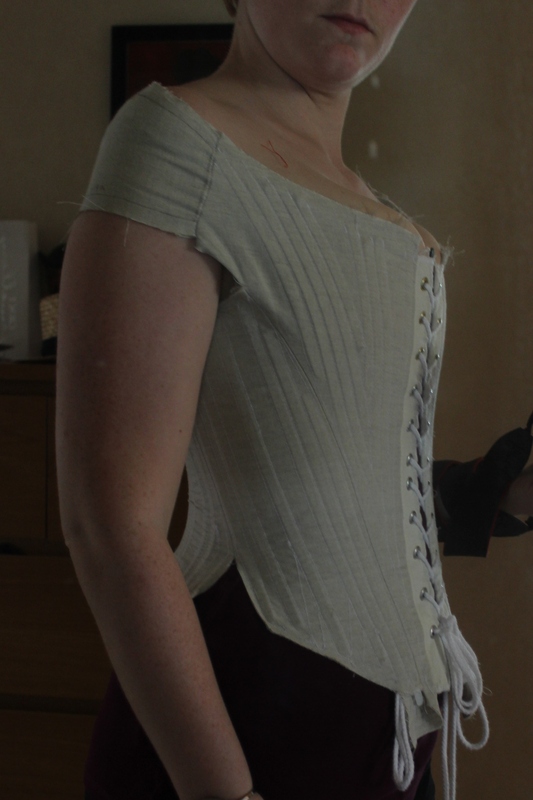 The thinness of the whalebone was really necessary to keep the difference in size as small as possible (the thicker the bones the bigger the size difference). You can clearly see the difference from left side (boned) to right side (un-boned) in this picture. Once all the bones was inserted, I put it on for a try. 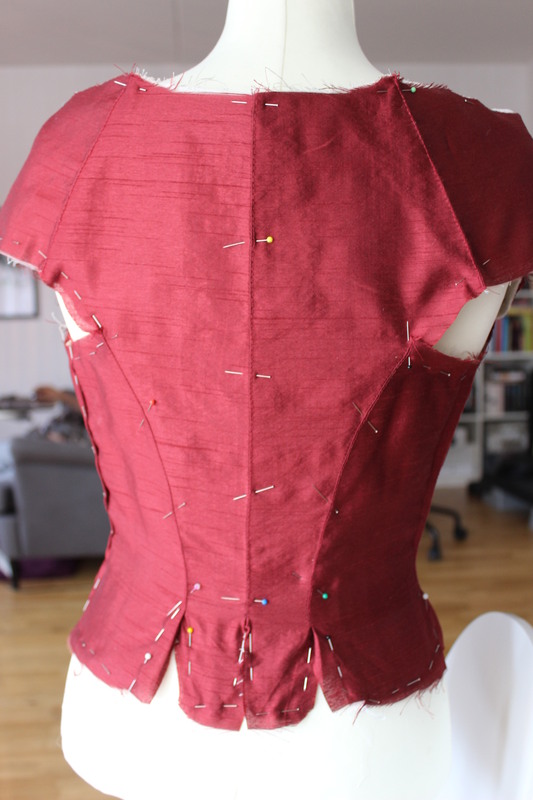 It looks awesome, and with some minor adjustments (like adding a few more bones to the front and back) I was good to go. I love how beautiful the interior is before being covered up. Then it was time to start on the exterior fabric. 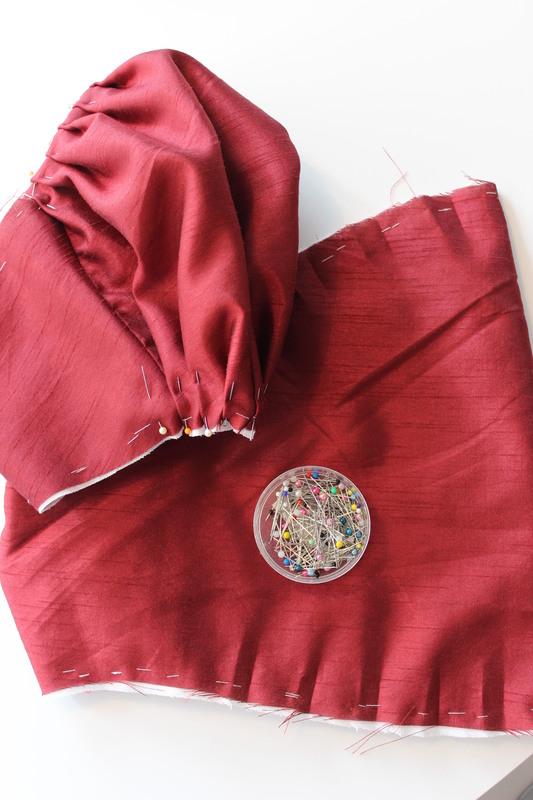 After keeping my eyes open in my local fabric store since January, in June, I finally decided to take the 1 hour trip to the next towns fabric store (which is awesome by the way). And I did not regret it. 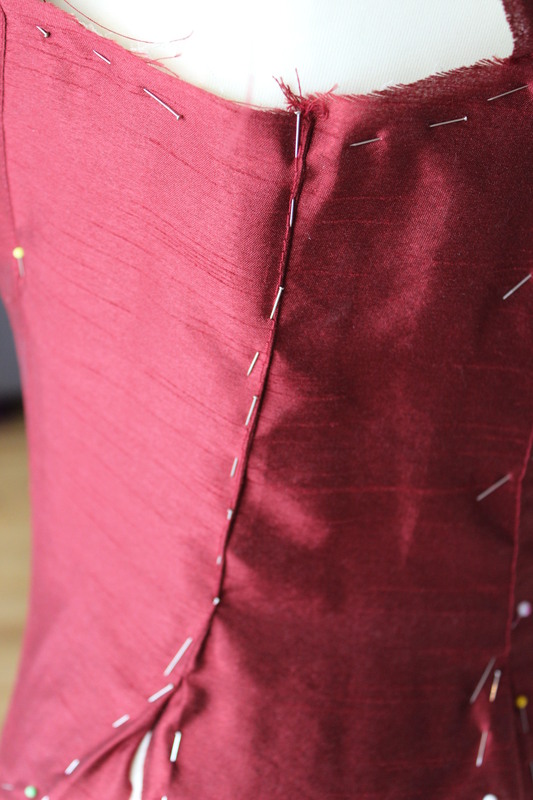 Since the fabric was a bit slippery and thin, I decided to stitch it together using my sewing machine before adding the strengthening and decoration hand finishing on top. 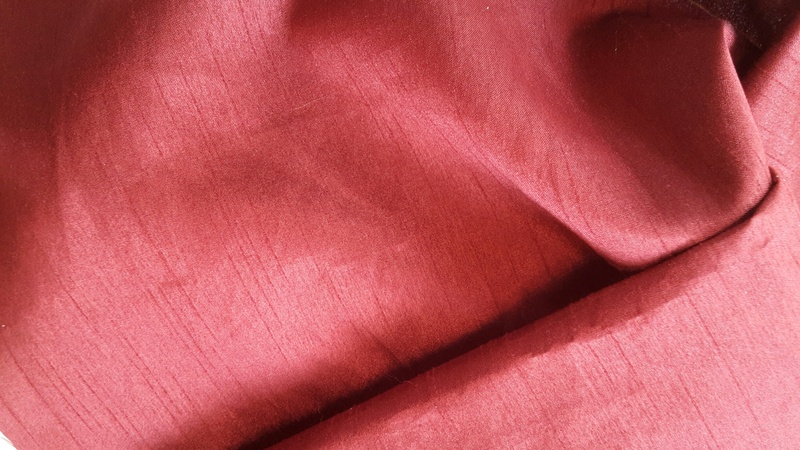 Then it was time to cover the foundation in red faux silk. 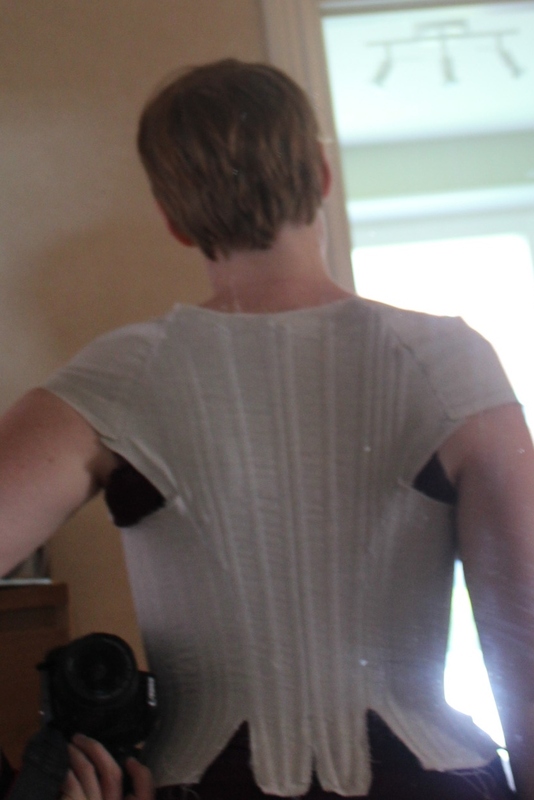 I’d accidentally made the outer layer a bit to big at the side seam, and tried to pin it down to fit. After some fiddling I decided to let it be for now, and to take the excess in later if needs be – better to big then to small. 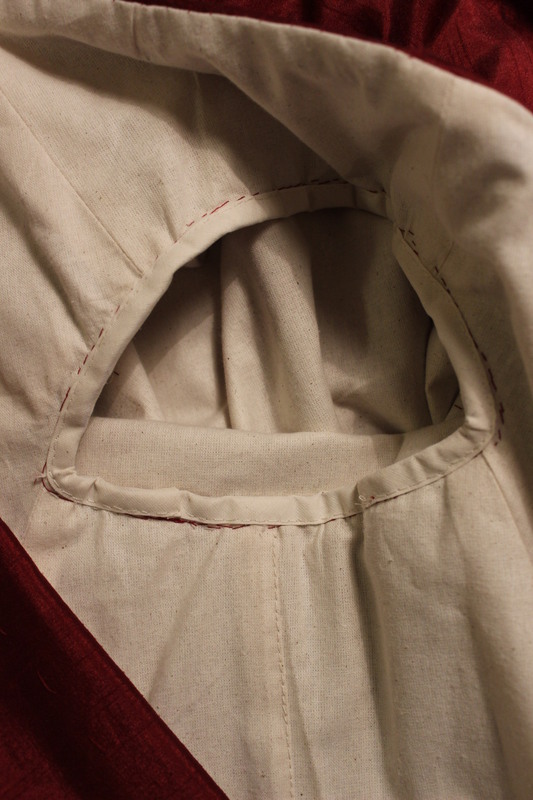 The linen lining was a bit easier to fit into the bodice. 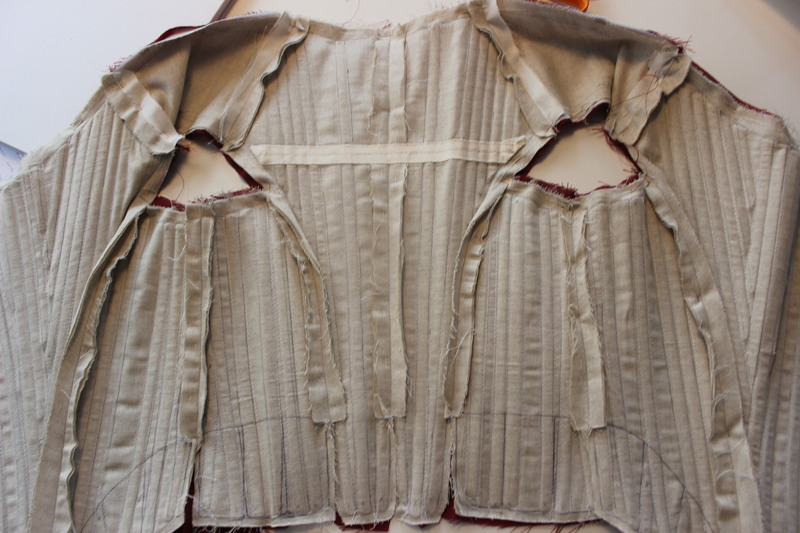 Once the main bodice pieces was basted down I started working on the sleeves. 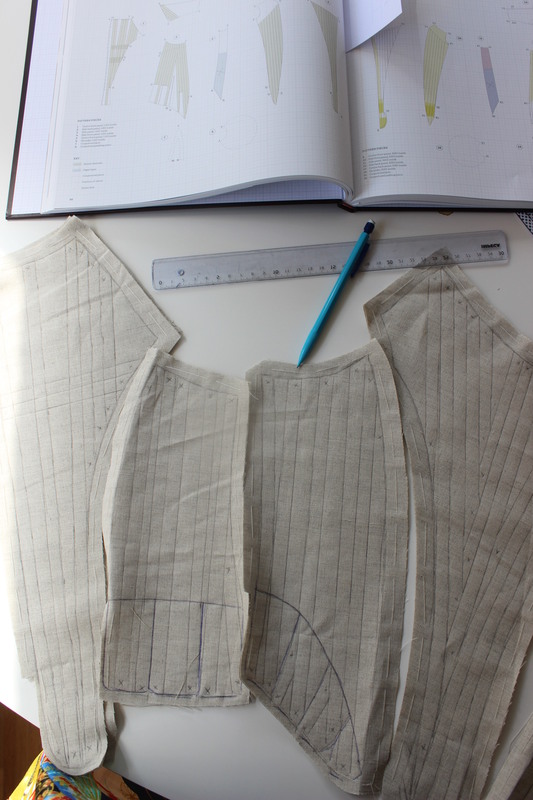 Drafting the pattern using my books as a guide. 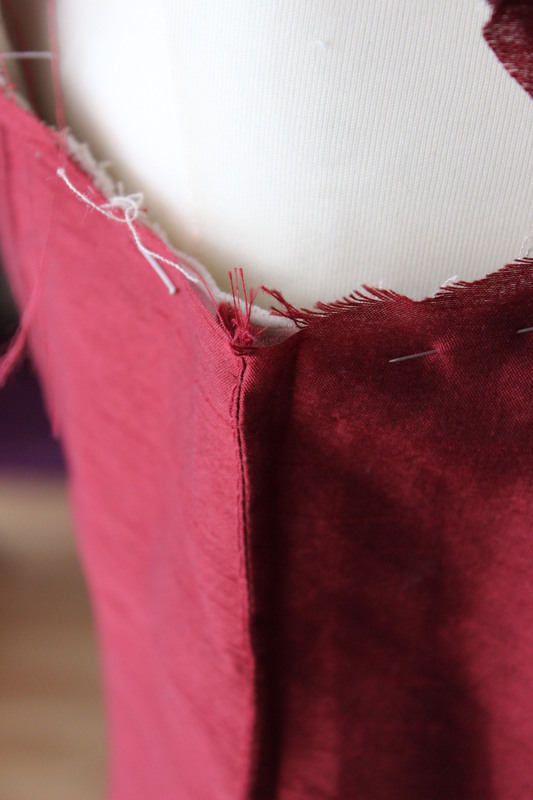 Then I just basted the red fabric to the interning (aka lining), stitched the seam together and pinned the pleats. 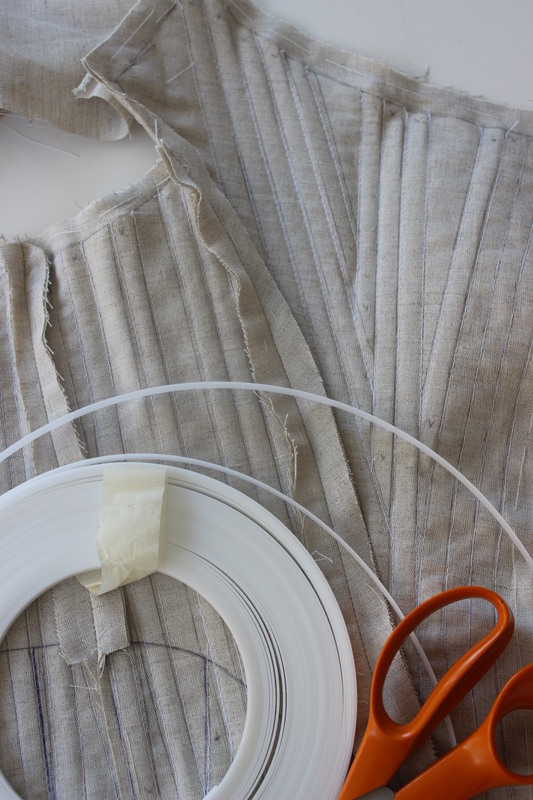 I pleated the sleeves by hand, and sewed chains of thread to keep the pleats in place. 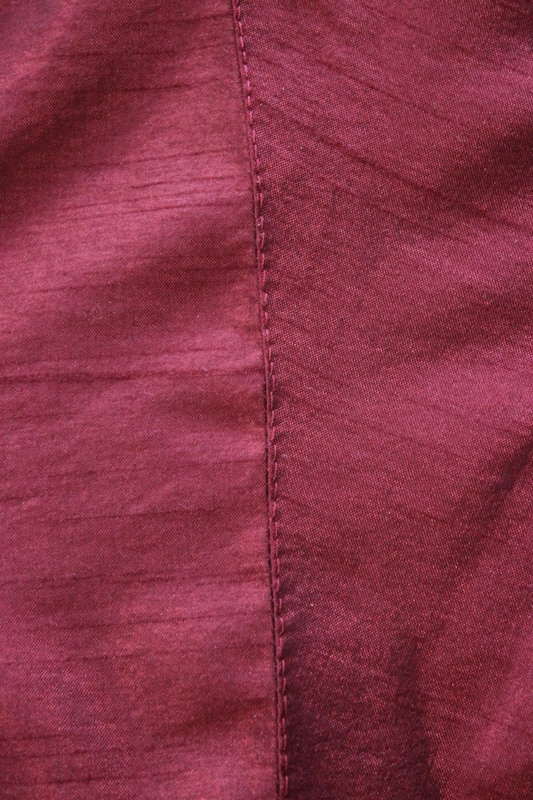 And finished them of by folding some self fabric trim round the lower edge. 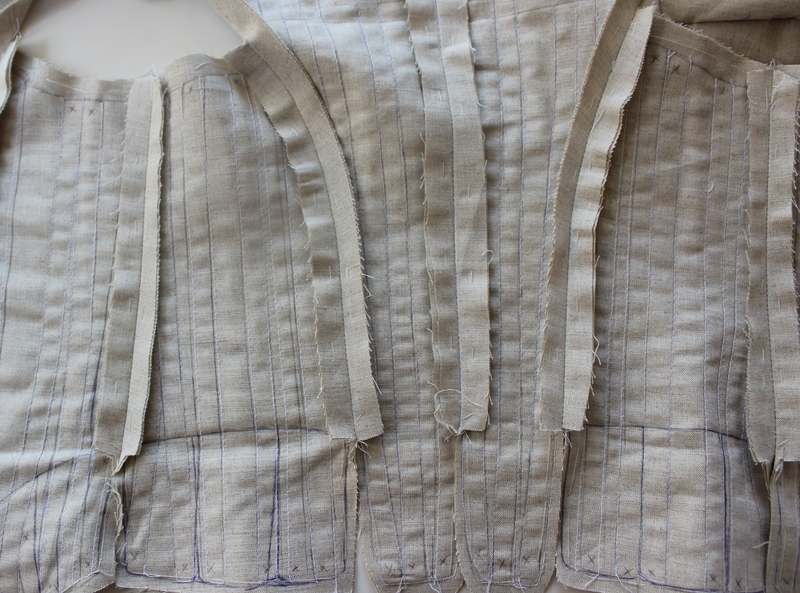 The sleeves ready to be set. 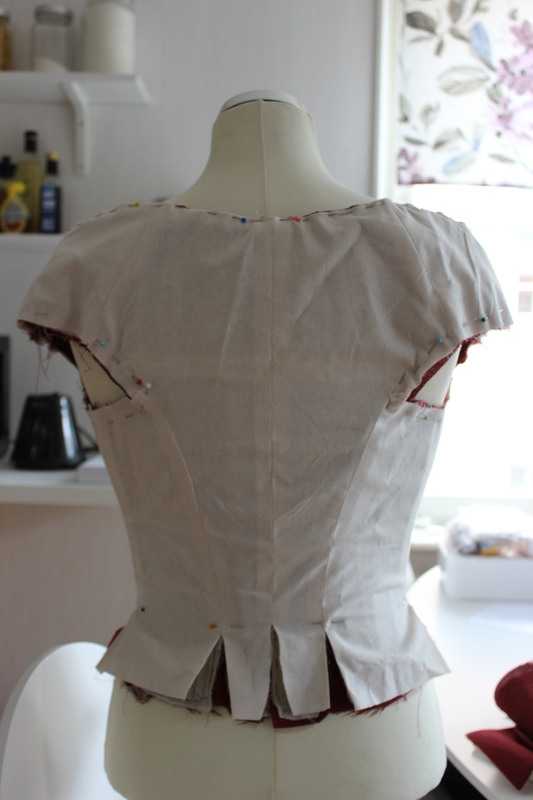 Then I set the sleeves to the bodice and finished by binding the arm holes using bias tape. 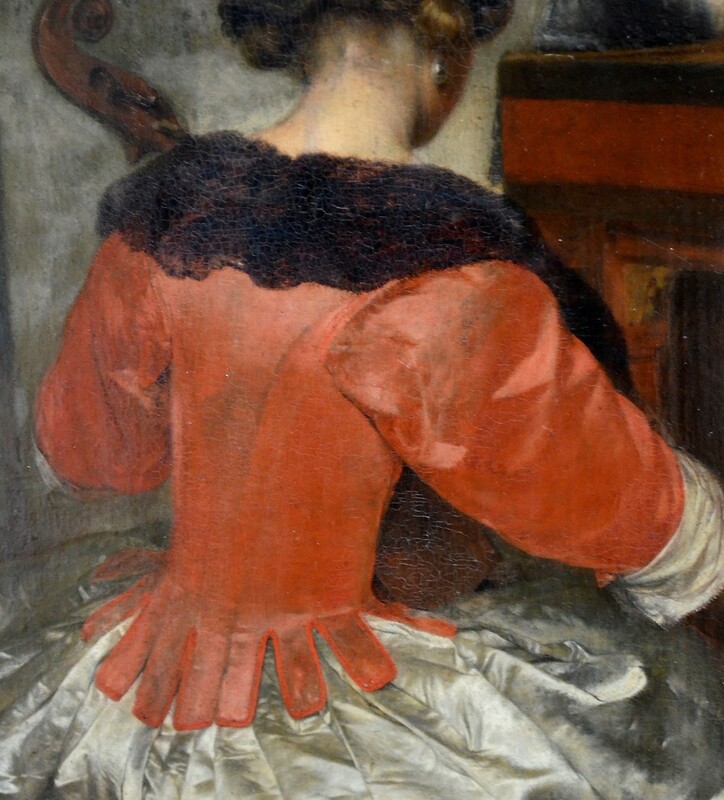 I feel myself falling for the beauty of 17th century to. The more I reserch and create the more I love the era. That’s what I feel as well- the more I see, the more I like! The shape is lovely and I like the colour as well. And I’m in awe of your speed!